Whitewater Excitement – Since 1978, California white water rafting at its best! Since 1978, Norm and the staff at Whitewater Excitement have made our guests and the continued improvement of our trips our number-one priority. You’ll appreciate our 5-Star, best-in-class guarantee of customer service, the way we keep our staff of super fun, trained and well-informed, and the fact that our American River rafting campground facilities are continually upgraded. We are also constantly adjusting the menu in order to provide you the finest and most delicious food anywhere. This truly is a California river rafting vacation that everyone will love. Norm Schoenhoff, owner of Whitewater Excitement, is still enjoying the rivers after 40 years of river running. He and his son, Phillip, run the business and are either on the river guiding or around our camp everyday making sure trips are run the way they are designed. Here at Whitewater Excitement our goal is for our guests to have the most enjoyable and exciting adventure vacation possible. We offer trips on four of California’s most stunning rivers: The South Fork American, Middle Fork American, North Fork American, and the Merced. 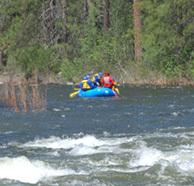 We understand that there are numerous choices for California rafting tour operators. Choose Whitewater Excitement, you’ll be glad you did! Our Preferred Guest Discount is the best in the business! As a way of saying thank you to our loyal guests, this discount gives them special discounted rates to trips and at our camp stores. 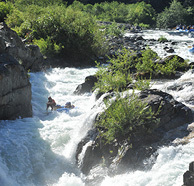 Whitewater Excitement was born during a yearly trip during the season-end of the Rogue River. As I was sitting with a group of my friends around the campfire one evening, we began talking about how much we all loved rafting in California. Someone said that we should form our own California river rafting company and show people the American River ourselves. As the conversation went on I became very excited about the idea even though for everyone else it was a mere fantasy. For me it was something far more. I first heard about California River Rafting when I was 16 years old and was reading a publication about adventurers seeking new excitement. In it there was a story about some people who were taking on the rapids of the South Fork of the American. It gave a description of the trip, the river and the rapids. After reading that I decided that if someone else was doing it, then I could. In May of 1972 I gathered up some friends and we began our American River Rafting adventure. From the first moment I saw the South Fork of the American River I knew this was the start of good things to come. That feeling of adventure, fear, excitement and challenge is still with me some 35-plus years later. It is my hope to share this feeling with the people who raft with Whitewater Excitement. Taking a person who is entirely new to river rafting, and who is actually quite scared, and having them say that at the end of the trip, “Wow, are we done already? I need more rapids!” is all the reward I need. Sharing the excitement of rafting, and the beauty of the river canyon, is what I want Whitewater Excitement to be about. While driving back from an American River rafting trip with a group of guests not unlike the one the day before or the day before that, a conversation began with a couple of the guests. One man said that this trip was truly the most exciting thing he had ever done in his life. The other man agreed and said that he had dreamed of a weekend like this for the last five years. They both added that this was the first time in nearly that long they had had time to laugh, relax, and spend quality time with their wife and children. The feelings of stress he had carried with him for so long was gone. This really moved me, and continues to today. He has rediscovered his wife and kids and now remembers what is really important in life. Whitewater Excitement is directly responsible for making peoples’ lives better. I often think to myself, “YES! This is what it is all about.” Removing people from their stressful working lives and putting them in a situation where they can relax and experience new challenges and excitement! American river rafting in California and Whitewater Excitement is about sharing adventure and helping our guests experience things they would not normally experience on their own. It is about more than the rivers, white water rafting, and wild rapids (however, these are the paths we use), it is about sharing ourselves and sharing experiences with people we do not yet know, but who we will know after a very short time. Come share American River rafting in California and Merced River adventures with us at Whitewater Excitement! You’ll more than likely find me right there among the staff either guiding, checking in guests, or even cooking breakfast for all our guests. Come on up and introduce yourself to me, I love meeting new people! Our Private Riverside Campground is one of the Best on the River! Best Facilities — We’ve deliberately concentrated our efforts on 5 rivers for the past 34 years, and this allowed us to develop and maintain some of the best facilities on any river in California. Facilities continually upgraded — Our American River campground has been upgraded with hot showers, and a Shaved Ice Cart. Not into Camping Try one of our Cabin Tents!! We have just purchased 3 new ones that add to our existing 2. All of our cabin tents are on platforms overlooking the river, and include 4 deluxe cots and deluxe sleeping pads! Call today to reserve one for your upcoming trip. Comfort and Adventure — Our more than comfortable facilities allow our guests to fully enjoy their adventure. Our South Fork Base Camp is by far the most well equipped, comfortable camp on the river. This allows us to enjoy the “wilderness” side of our river trips but still benefit from some of the usual niceties of life. Our camp is located directly on the banks of the South Fork of the American river, near Coloma, on 20 acres of wilderness. This site is used only by our guests and is not a public camp area. We have equipped it with full bathrooms that have flush toilets, hot showers, sinks and mirrors. We also have a sunken sand volleyball court, along with horseshoe pits and ping pong in the rare case that you didn’t get enough exercise on the water! Our camp store is loaded with sweatshirts, t-shirts, hats, snacks, camping items and much more. Our new gathering area is located right next to the camp store and was designed for you to relax and hang out after your trip, watch river videos, cool down with a shaved ice cone and reminisce about your adventure. Coming Soon — Look for our WWE Camp Video that gives you a great view of our deluxe camp area. Our riverside campgrounds are some of the best on the river! Many of our campsites offer stunning river views! Best value & pricing guaranteed — in California white water rafting. Our preferred guest discount is truly the best in the business! And to add even more ease to your decision making — we will match any competitor’s better offer publicized or quoted in writing. “Best campground on the American River” — Our Californian American River rafting experience offers the added bonus of a deluxe private riverside campground. Nestled in a stunning natural setting, the campground includes spacious bathrooms, hot showers, shaded riverside campsites, horseshoe courts, green grass, volleyball, and more. And we all know that location really does matter! The view across the South Fork of the American is total wilderness, not even a hint of development. 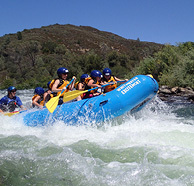 Top-of-the-line American river rafting equipment — to ensure your safety and comfort. Outstanding meals and beverages — everything’s included for your Merced & American River rafting trips. #1 choice for California white water rafting adventure — you’ll love your California white water rafting vacations with Whitewater Excitement.